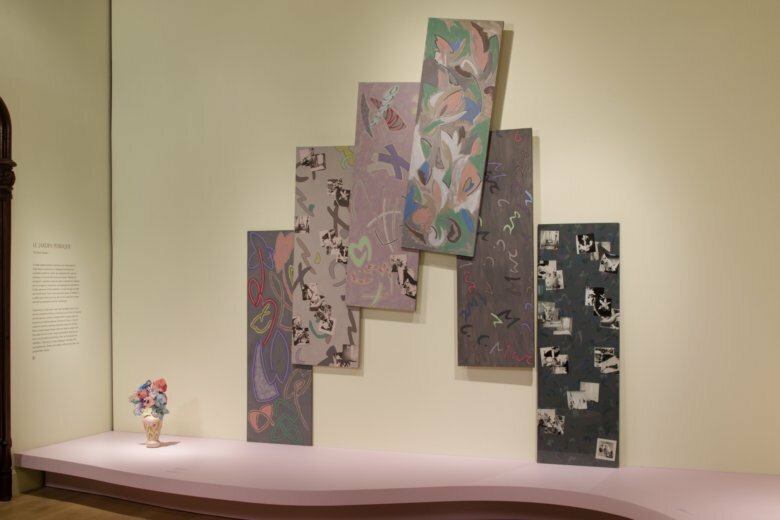 NEW YORK (AP) — The furniture, drapes, wall coverings, ceramics, textiles and other works by London-based artist Marc Camille Chaimowicz are as cross-disciplinary as they are distinct. They reflect and draw inspiration from the home, but are closer to sculpture or performance art than home goods. Tending toward muted pastel pinks, lavenders and greens, Chaimowicz’ pieces are better known in Europe than in the United States. Until now, that is. “Marc Camille Chaimowicz: Your Place or Mine.,” billed as the first exhibit in the U.S. devoted solely to him, opened at The Jewish Museum in New York in March and remains on view through Aug. 5. “We gave the show a playful and ambiguous title to reflect the playfulness and ambiguous nature of the work, and as a nod to the fact that this museum itself was once a home,” says associate curator Kelly Taxter, who organized the exhibit at the Fifth Avenue museum, in a mansion built in 1908. Chaimowicz doesn’t delineate between fine arts, crafts and design, she says. The show includes works made between 1978 and 2018, including some never-before-exhibited pieces and three new commissions. Born in post-war Paris to a Polish Jewish father and a French Catholic mother, Chaimowicz was 8 when his family moved to Britain. He has lived and created in three London apartments over the past 40 years, and these apartments served as both subjects and sources of his work, says Taxter. The show is arranged thematically into five main sections: The Entrance, The Library, Here and There., The Salon and The Public Garden. In The Entrance, a row of coat hooks display jackets and trousers decorated with Chaimowicz’ silk-screened patterns, which resemble wallpaper patterns. It’s a hint of the work throughout the exhibit that emphasizes decoration. And it’s of course an image of something one might see in a home. The Library features an entire gallery devoted to decorative “artist’s books” made by Chaimowicz. The books somehow straddle the artistic, poetic and political realms. This section also features two lampshades designed for this exhibit. Starting in 1975, Chamowicz shifted his focus primarily toward home interiors as an inspiration and starting point for his pieces. “His apartment itself was a work of art,” says Taxter. The small gallery called Here and There features a combination of self-portraiture and staged images showing partial views of interiors, in which Chaimowicz is always looking elsewhere. Enormous panels covered in patterns made using a roller brush — “much like families in Poland might have painted an apartment,” says Taxter — are propped up as sort of movable wall coverings, to be rearranged and overlapped on a whim. Because his work is so site-specific, the exhibit draws on the building’s ornate interior and views onto Central Park. One piece, “A New Curtain for KT” (2018), features sheer woven and embroidered curtain fabric in pale greens and pinks near a soaring gallery window overlooking the park. “End Game,” also from this year, has a pair of panels of mirrored glass, each about the size of a door, inset with diamond shapes and featuring chrome knobs where one might place door knobs. The work is set against a wall at the end of the exhibit and is not meant to be opened, but the panels are so inviting — and so resemble real doors — that some visitors have mistakenly tried to go through them, Taxter says.